Brian Galea has put himself into a strong position at the ISSF World Cup trap competition after finishing the opening day just one clay short of top spot, in Siġġiewi, yesterday. 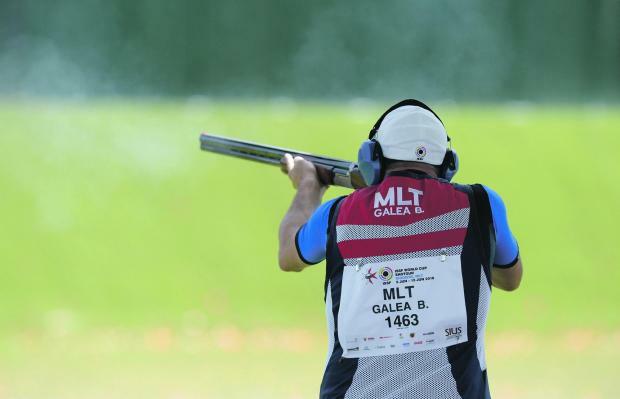 Galea, winner of a bronze medal at the 2018 Commonwealth Games in Gold Coast, had an impressive start to the qualifying phase when firing a straight of 25 clays in the opening round. He followed that up with a solid 23 to finish the day with 48 points, one behind four joint-leaders – Andreas Makri (Cyprus), Jack Wallace (Australia), Antonio Bailon (Spain) and Marcelo Viaro (Brazil). With the top six progressing to the final stages of the competition, Galea remains in contention to make the cut even though he will have to stay 100 per cent focused as currently he is level with eight others on 48 points. William Chetcuti hit scores of 22 and 21 to finish the day on 43 points that left him in 87th position. Mario Buhagiar compiled scores of 22 and 19 to place 100thfrom a field of 111 shooters. The trap event resumes today when the contenders will be involved in another three rounds, totalling 75 clays before the finals for the coveted medals. Finland’s Satu Makela-Nummela, 47, won her seventh World Cup gold medal yesterday after triumphing in women’s trap. She competed against a line-up of other multi-decorated shooters, missing three of her first 20 targets and then moving into the top position in the second half of the decisive phase, when she only missed two more. “I’m happy with my performance, I started really well and then I was able to keep that pace despite the weather... it was very hot today,” said Makela-Nummela after the medal ceremony. “Indeed, I’d say it was like a Finnish sauna. At the Siġġiewi ranges, Makela-Nummela finished with 44 hits out of 50 targets to secure her second consecutive World Cup gold, adding it to the one she won in Changwon last April. She was joined on the podium by two first-time medallists – Germany’s 31-year-old Katrin Quooss, who took silver with 41 hits, and third-placed Russian Ekaterina Rabaya. The latter secured the bronze medal in her first final participation, hitting 30 clays out of 40 targets. Mikaela Galea, representing Malta, failed to make the final when she finished 45th overall with 99 points. A total of 56 shooters took part in the women’s trap event.